Beautiful You: Teen Blog Series Week 7 | How To Balance Blogging With School or Uni! 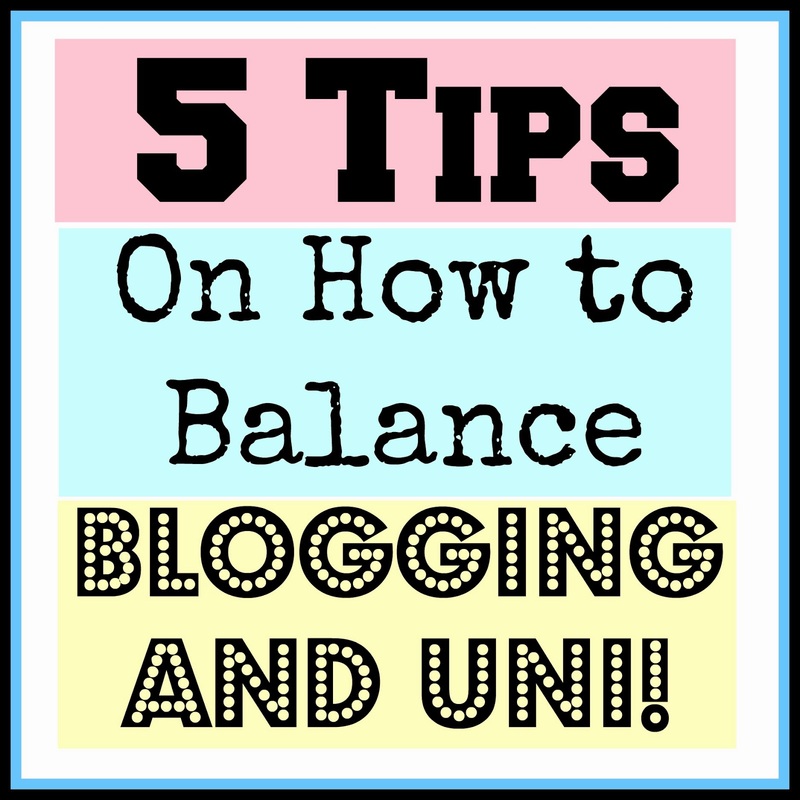 Teen Blog Series Week 7 | How To Balance Blogging With School or Uni! This is definitely a topic that is relevant to me at the moment because I have been the worst person ever for keeping to a schedule. This year at uni is proving to be very demanding and is putting a lot of pressure on us so early on, I am trying my best to plan out my week to allocate time and effort for my blog as I easily put this on the back foot. Therefore I shall go ahead and share these tips with you guys today, these are what works for me but they may not work for everyone! 1. Plan your week- I have a weekly planner which my house mates bought me for my birthday last year and every Sunday I sit down and plan my week, I start off by writing down the times that I have to be on university campus and then working my time around that. Then I move on and plan what blog posts I plan on writing on the three days that I blog and make sure that I either have them typed up and ready to go or if I know what I have to do for them. Next I have to work out what I am going to film that week for my main channel and then allocate a time slot to be able to film, edit and get that uploaded for the following Sunday. Sometimes it can be really hard to fit everything in but you have to allow yourself to have time to do the things that you want to do. 2. It's okay not to post- bloggers can so easily be dishearten when they are unable to stick to their schedules but if you don't have any inspiration or you don't have any ideas for posts then it is better to not post. There really is no point in posting a half hearted blog post just for the sakes of sticking to a schedule, it is okay if you don't post and people won't hate you for it. I know I have done this many time and I still have my loyal followers who still read my blog no matter what, your not going to loose them all over night. 3. Make a list of potential posts- if you go into a week or a period of time with out brainstorming ideas it is going to be hard to keep on top of, therefore write a list of possible blog posts that you have ideas for. These don't all have to make the cut they are just there so there isn't so much pressure on you to come up with three ideas a week (in my case) and they can easily be written up and published if need be. 4. Give yourself breaks- blogging non stop can be tiring sometimes, everyone gets to that point when they just don't have ideas any more. Take time off and do things that could give you more inspiration, read other blogs, go out and see a different part of the world, do a little shopping or just take a step out of your comfort zone for a while. This will stimulate your mind and give you ideas for posts that could boost your blog, sometimes taking time out can exactly what you need! If there is a particular stressful period at uni or school then just take a step back, all of your followers will understand and some of them may even be going through the same. 5. Make sure the content is you- when you are under a lot of strain it can be really easy to just post anything random that has no link to your blog and doesn't reflect your normal blogging style just simply to say that you have something up. This can sometimes reflect worse on your blog rather than you just not posting at all. Make sure that what you do post is true to yourself and it doesn't really matter at the end of the day how long it takes you to come up with the idea as long as it comes from you. I'm not saying don't take inspiration from else where just take it and make it your own so it fits in and blends with the rest of your blog. I hope these ideas help at least some one and if they do then be sure to leave a comment below letting me know that I helped. Like I said this is a very stressful time for me at uni but I know that when I've done it I will be fine so you just have to push yourself. The next few posts on here are going to be a bit different, as you may know I am going to New York in just over 2 weeks time and I thought I would share how we have planned and are preparing for the trip with you all so if you are looking forward to that then let me know! I hope you are all well, that you had a good weekend and I shall see you all on Wednesday! I think number two is really important, blogging shouldn't be forced and sometimes you're not going to feel like blogging, or you won't have the time and it's important not to beat yourself up about it.